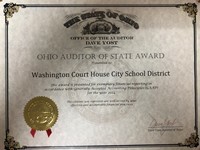 The Treasurer is employed by the Washington Court House Board of Education to administer, in cooperation with the Superintendent, the financial, legal and contractual business of the school district. Like the Superintendent, the Treasurer reports directly to the Board. 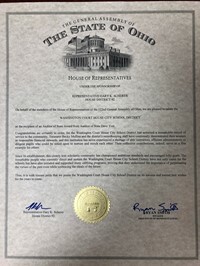 The statutory duties of the Treasurer are set forth in Ohio Revised Code sections 3313.22 through 3313.32. 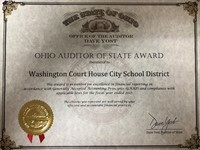 The community depends on the Treasurer’s Office to be the custodian of district funds, to invest district funds wisely, to maintain and provide accurate financial information, to prepare reports that comply with governmental accounting standards, and to ensure that the funds of the district are spent within the confines of the law. The Treasurer’s Office is responsible for activities associated with accounts receivable, accounts payable, payroll, debt matters, capital projects, investments, and property accounting. The Treasurer's Office also serves as secretary to the Board by maintaining board meeting minutes and managing Board communications. In addition, the Treasurer’s Office facilitates short-term and long-term planning activities to ensure adequate funding for all areas of education. 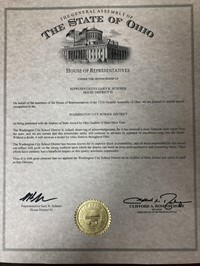 Becky J. Mullins assumed the position of Chief Financial Officer/Treasurer of the Washington Court House City School District on August 1, 2013. Prior to this appointment, Ms. Mullins served for 17 years with the Auditor of State’s Office holding various positions within its Local Government Services Division, effectively assisting local governments with financial, accounting and budgetary issues and providing professional consulting services. Ms. Mullins acquired her bachelor's degree in accounting from Capital University and is a Certified Public Accountant (CPA). Ms. Mullins professional affiliations include the Ohio Association of School Business Officials (OASBO), the Ohio Society of CPA’s, and the Ohio Government Finance Officers Association (GFOA). All school districts in Ohio are required to file a five (5) year forecast by October 31, and May 31, in each fiscal year. The forecast notes included in the document contain the best data available at this time.